Beach House Bar and Grill > Club Card | Beach House Bar & Grill is an Australian themed Bar & Grill celebrating Australian Beach culture and cuisine. Club Card is a loyalty based rewards programme that offers great value for our regular customers. To become a club card member simply dine at Beach House on a regular basis and fill out an online form at the counter or enter your details into our website. Club Card members enjoy 25% off their main meals every time they dine! Additionally you will receive members’ only special offers and information. Q. Can my partner use my Club Card? A. No, club card discounts are for the cardholder only. Couples need two cards to both get the discount. Q. Can I use a Shop-a-Docket and my Club Card? A. No, Club Card discounts are not to be used in conjunction with any other offer. Q. Does the 25% discount apply to the whole bill? A. No, the Club Card 25% discount is only for the cardholders’ Main Meal. Q. Why do some meals not discount for Club Card Members? A. Club Card 25% discount applies to Main Meals only. This means dishes from the Pasta, Grill, Ribs, Schnitzels, Seafood and Salad sections of the menu. Q. Can I use my Club Card at any Beach House Bar & Grill Venue? A. 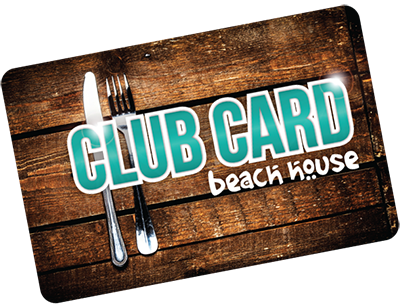 Yes, Club Cards can be used at any Beach House Bar & Grill venue, irrespective of where the Club Card was originally obtained. Enter your contact details via our website or online form at the bistro counter - some offers will be sent via email, others via SMS. Choose your local Beach House Bar & Grill venue. This store will send out exclusive special offers to you from time to time. Once the form is completed you will receive a Signup Voucher via Email. Print your Signup Voucher or show it on your phone at your local Beach House to receive your club card.